Opera non Verba - Deeds not Words, has been the motto of B Company "Kingsmen" from Vietnam through Desert Storm, Iraqi Freedom and Enduring Freedom to the present day. This proud unit has been an integral part of the 101st Airborne Division "Screaming Eagles" since 1968. 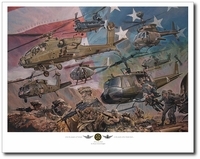 In the fall of 2010, B Company was task organized to 3rd Battalion, 101st Aviation Regiment and in February 2011 deployed to Forward Operating Base Tarin Kowt in Afghanistan, in support of Operation Enduring Freedom XI-XII. 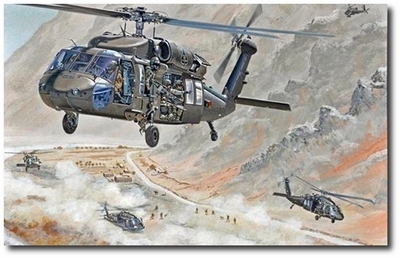 The scene depicted shows "Kingsman" UH-60M Blackhawks inserting Task Force 66, comprised of Australian Special Air Service Regiment Operators and Afghan Partner Forces.